Sometimes work can get in the way of care of your body and that includes keeping a regular schedule. Did you know that people with spinal cord injury follow a daily bowel regime? Part of their personal care includes keeping a regular schedule. Because the nerves that trigger the body to eliminate waste no longer work, setting the same time everyday for daily bowel care is critical. Everyone can benefit from a regular daily schedule. And yet, sometimes life gets in the way of our best plans with irregular work schedules or travel. Constipation can result from irregular sleep or daily activity schedules. Occasional constipation can be treated with laxative medication. Laxative suppositories are the trusted bowel stimulant for daily bowel regime and can be used by people who are 'training their bowel' to get back to daily rhythm. Synalax suppositories contain the active ingredient, bisacodyl, which is a stimulant laxative. 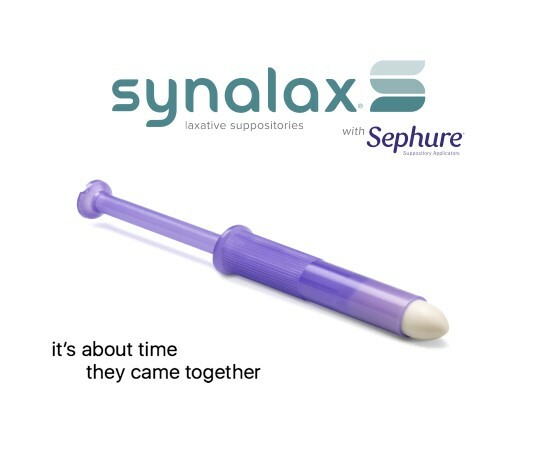 Packaged with the trusted disposable Sephure applicators, the offering provides fast, effective relief of constipation.